Egg nog on Christmas Eve was as sure a thing as Santa Claus on Christmas morning. As a child, few things were more challenging to the spirit than the excruciatingly long hours of the night before Christmas. The concept of having to wait even the slightest moment longer for Santa’s arrival was beyond comprehension. One had to dig deep down to find the strength and patience required to make it through the endless night. The only thing that made this infinite evening bearable was the knowledge that Roger, our close, broad-smiled family friend, would soon arrive. Roger’s tradition was to deliver gifts to his friends and family on Christmas Eve. He and his dog Sport would pile into the car with toys and trinkets, bags of spiced nuts, and, most importantly, his homemade egg nog. Roger and Sport would pull up to the curb at our house and Willie, Allison and I would race to the door, ecstatic and nearly shaking with anticipation, knowing he would have a gift for us, always smartly chosen, a token to entertain us until we would finally, finally, fall into a slumber. As I’ve grown up, the simple visit from Roger has drawn far more meaning, a meaning that can only come from a better understanding of life and what really counts. I’m also old enough to have the egg nog now – a perk that cannot be overstated! Roger’s recipe is one that was handed down to him by the Van Meter family of Lexington. It is old and simple, the trappings of many a classic recipe. 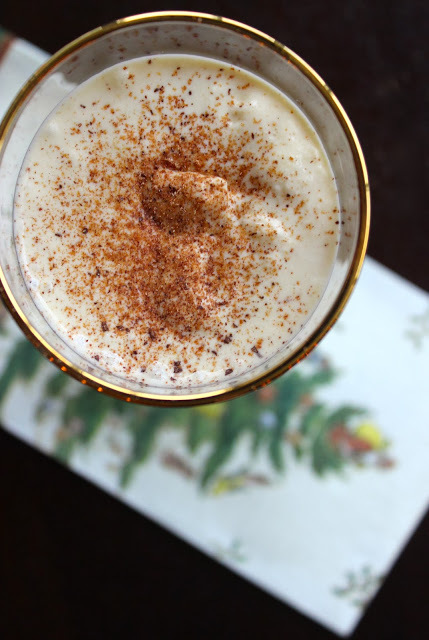 Eggs, cream, sugar and bourbon and frothed and folded, resulting in a thick and luscious cocktail most suitable for enjoying by the fire and a lit Christmas tree. 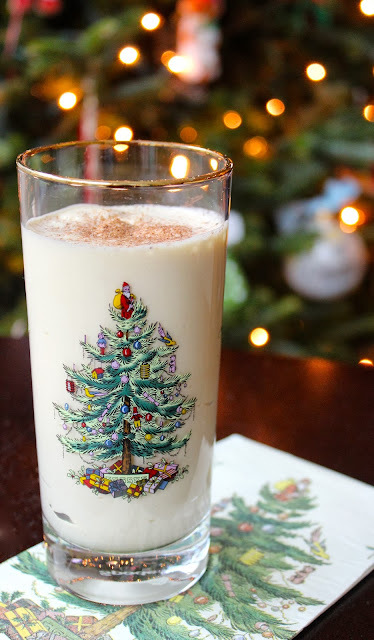 Choosing to pay Roger’s friendship forward, my family has since shared the tradition of Christmas Eve egg nog deliveries. I can’t think of a better way to show love and thanks this Christmas than with this homemade treat. Merry Christmas foodie-friends! Begin by separating four eggs, reserving both the whites and the yolks. In a large bowl, combine the egg yolks with three quarters of a cup of sugar. Beat until fully combined, light, creamy and smooth. Slowly add one cup of good bourbon to the eggs and sugar, beating until mixed thoroughly. In a separate bowl, beat one pint (two cups) of whipping cream until light and airy, the cream forming stiff peaks. Gently fold the whipped cream into the egg, sugar and bourbon, being careful not to deflate the cream. Once the whipped cream is fully combined, beat the four egg whites in a clean bowl until they are also light and airy, forming stiff peaks. Carefully fold the eggs whites into the egg nog, combining thoroughly but taking care not to over-mix. Allow to chill in the refrigerator over-night, the ingredients blending and settling into one another. The following day you will find that the liquids have settled to the bottom and the cream and egg whites are thick on the top. Gently refold the mixture and serve, garnishing with freshly grated nutmeg overtop. Merry Christmas! In a separate bowl, beat one pint (two cups) of whipping cream until light and airy, the cream forming stiff peaks. Gently fold the whipped cream into the egg, sugar and bourbon, being careful not to deflate the cream. Once the whipped cream is fully combined, beat the egg whites in a separate bowl until they are also light and airy, forming stiff peaks. Carefully fold the egg whites into the egg nog, combining thoroughly but taking care not to over-mix.